This is a review of the product Hair-vit which has been manufactured by Health Aid. The manufacturer of this product claims that Hair-vit capsules contain the nutrients required by your body for the health of your hair in the form of vitamins as well as amino acids and not only can it help improve the color, strength and shine of your hair but it can improve the thickness of your hair as well. Read on, to know more about its ingredients and our opinion about whether it is the right product to take for the growth of your hair. Other ingredients include Gelatin, Purified Water, Beeswax, Glycerol, Soybean Oil, Palm Oil, Coconut Oil, Di-Calcium Phosphate, Ferrous Sulphate, Nicotinamide, Thiamin Mono Nitrate and Folic Acid. It is recommended that adults and children over the age of sixteen take one capsule of this product daily with breakfast. This product contains iron and so if it is taken in excess, it can cause serious harm to young children. In case of an accidental overdose or an allergic reaction to any of the ingredient in the product, you need to contact a doctor immediately. The price of one bottle of this product is listed as $13.00 on the company’s website and includes 30 capsules which are enough to last a full month. The manufacturer also offers a discount of $6, if you order 3 bottles of this product as well as free delivery on every order over $40. The manufacturer of this product does not offer any kind of money back guarantee. If you are not satisfied with the product then you have no option of returning it or getting your money back. The product only has a few reviews on the company’s website which makes it a questionable purchase. 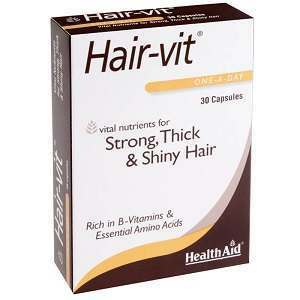 Hair-vit by Health Aid is a product that has been designed to improve the health of your hair. It can nourish your hair follicles and supply the minerals and vitamins that are necessary for the growth of your hair to your body. It can also improve the texture and thickness of your hair and prevent hair loss. However, it has gluten in it so it is not suitable for vegans and vegetarians. The manufacturer also hasn’t offered any kind of return, exchange or money back guarantee. So you have to buy it at your own risk. The ingredients of this product also include soy and yeast, so it is not ideal for certain individuals with allergies to these items. The bottom line is that Hair-vit is probably not the right product for you. John Brownstone	reviewed Health Aid Hair-vit	on July 29th	 and gave it a rating of 2.5.